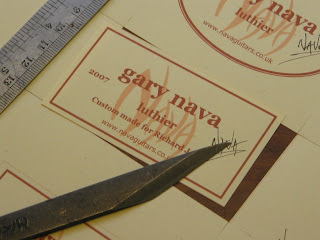 One of the last details was to print out the label with Richard’s name on it. This is a little touch that the client always appreciates. I delivered the guitar to him earlier this week and to say he was thrilled is an understatement! Although I felt that the guitar was as good as it gets, there’s always some apprehension: are you going to make someone’s dreams come true or not? I’ve not seen anyone so happy for a long time and his reaction was well worth all the effort. He played it like a man inspired! I think that Richard did get his dream guitar! 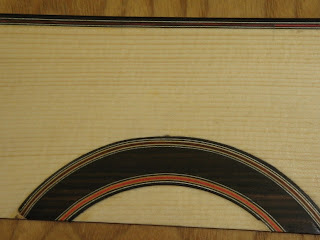 Below is a sample that I sent off to Ian for his Baritone guitar. He wants me to use red in the rosette and purflings. There are three different shades of veneer here to choose from, one is Paduk which is a naturally reddish wood and the others are two different shades of sycamore that have been dyed red. Photos never show the true shades, so making up a sample like this is the safest way to ensure that the client gets what he wants. We both liked the bright red so this will be used. 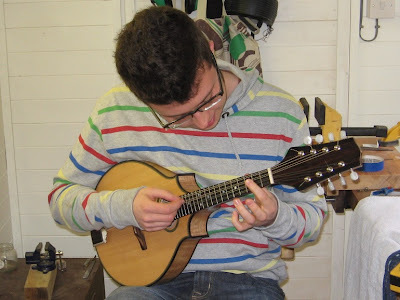 The two point mandolin that I have been working on is now completed and below you can see my son test driving it. I’m very pleased with it; it is such a beautiful little instrument. This is the first time that I have used this shape and the twin points allow real access to the high frets and visually it looks stunning! The French polish enhances the grain; the shellac must diffract or reflect the light in a certain way and although it is not as robust a finish as lacquer it is far more attractive. It also feels so silky! This mandolin will be up for sale on my website in the next day or so, I’m just waiting for some decent weather so that I can take some photographs outside! Getting back to guitar making!